Plumbing Needs? Get Out Your Smartphone! 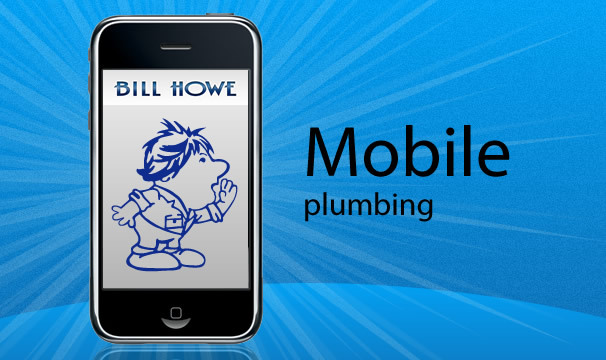 We launched a mobile version of BillHowe.com, optimized for viewing on smartphones and other mobile web devices. This particular mobile-friendly version uses the same font, colors, and URL structure (to support existing online marketing campaigns) as the standard corporate site and contains links to main services, customer reviews, coupons, and of course, a contact page with direct push to call functionality. With 25% of Americans accessing the mobile web on a daily basis, a number which continues to rise, it’s becoming increasingly important to ensure your site is optimized for smartphone and other mobile displays. What looks great on a 17” monitor doesn’t necessarily translate to a 3.5” handheld screen with limited scrolling capability. With mobile web development, you can be sure your users are seeing exactly what you want them to see. Your site is able to determine whether your visitors are coming from traditional computers (laptops & desktops), or a mobile device such as a Blackberry or iPad. The standard version of your site is served to those using traditional computers/browsers, while the mobile version is served to everyone else. Mobile- friendly sites generally consist of a single column layout that automatically fills the width of the mobile device’s screen. The entire page’s content can be viewed by a vertical scroll, images can be seen without zooming in, and links are large enough to allow for easy navigation. Oftentimes directions and a call to your business can be accessed with a simple touch of the screen. Attempting to navigate a regular website on a smart phone can be a frustrating task for anyone. Mobile sites go a long way in improving user satisfaction and are sure to keep visitors from jumping ship and looking for one that is. Since mobile websites are designed specifically for mobile standards and optimal download speed, users can spend more time browsing and less time waiting for your pages to load. For someone who has never seen the full version of your site, the mobile version may be their first impression of your company. We all know how important first impressions can be and a mobile website immediately helps you stand out from the competition, while creating a contemporary brand identity for your organization. Mobile websites create an unprecedented opportunity to connect with target audiences as they can be accessed anywhere, at anytime and allow for real-time engagement with mobile-specific features, including click-to-call and mapping functions. There’s added significance for local businesses who can capitalize on location detection technology, which can connect people to your site based on geographic proximity.